Looking for Halloween plans? Join us at La Maroquinerie for a Mexican-inspired Day of the Dead party. 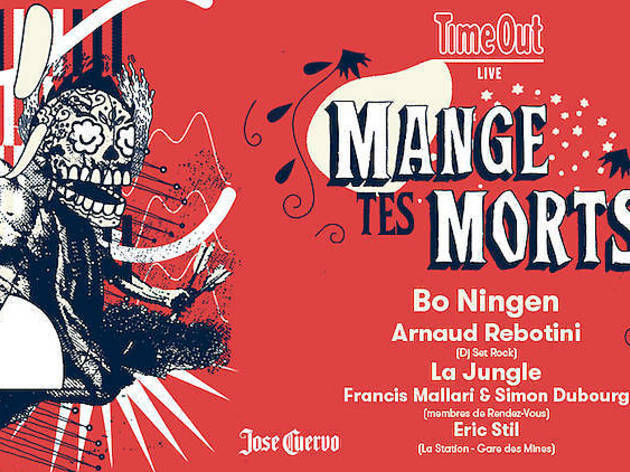 On Saturday 28 October, Time Out Paris is hosting the fiendish fiesta, 'Mange tes morts' ('Eat your dead') - a journey between heaven and hell with a backdrop of special artists, and DJ sets. One thing's for sure, you'll never see things the same way again. The four-piece Japanese noise rock band, will be swapping London for Paris in this special event. This rare performance at the Maroquinerie will be bordering on shamanic ritual, as anyone who has been to one of Bo Ningen's concerts will tell you. It might be hell that Bo Ningen are offering you, but we'll bet you will enter with pleasure. Rob Fitzpatrick, founder of Levitation Festival, says about Bo Ningen: "They're a group on the cross section of pyschedelic and proto-punk, with an incredible energy on stage. They came to Austin, Texas, in 2014 and it was exceptional!" One of the biggest electro artists on the French scene today, Arnaud Rebotini is currently making headlines for his soundtrack in 120 battements par minute (120 beats per minute), the film that hopes to represent France in the 2018 Oscars. One half of the group Black Strobe, will be hosting a special DJ set centred around rock music. If you've been in any Parisian moshpit over the last 20 years, chances are that Eric Stil was involved. The brains behind new place-to-be the Station, Stil is a master of beautiful rock sounds. He'll do us the honour of leaving the Station for a night to come and play some of his best vinyls. You don't really know where you are with La Jungle. And we love that. Swinging between experimental Krautrock and crazed electronic, step a foot in their universe and you'll be changed for good. Returning after playing at Rock en Seine with Rendez-Vous, one of the most popular groups on the indie rock scene. For 'Mange tes morts' they're offering a special DJ rock set, welcoming us into their multi-influence sound. And if you're still not convinced that this will be THE party of autumn, José Cuervo is offering a shot of Jose Cuervo Especial (Reposado) tequila to all guests. For eats, we'll have Mexican specialities by Zicatela. What? 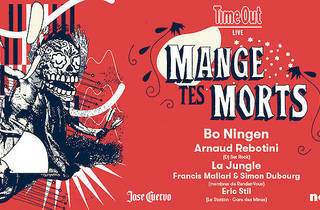 'Mange tes morts', Day of the Dead party by Time Out. When? Samedi 28 october 2017, 6pm to 2am. Where? La Maroquinerie, 23 rue Boyer, 20th.